Our Private Tours are between 8-9 hours from your hotel and includes: Pompeii the roman ruins, Monti Latteri (Milk Mountains) are the Campanian Apennines, Ravello the spiritual town of the coast, Atrani the smallest city in the south of Italy, Amalfi the main town of the Amalfi Coast, Conca Dei Marini home of the emerald grotto, Furore the fjord of Italy, Praiano the perfect sun trap, Positano the diamond of the coast. For more infomation about Private Tours Sorrento of Pompeii and Amalfi Coast from Sorrento, please contact us on the form below. Your Private Driver Guide will make stops for you to take photos of the beautiful view of Naples and Versuvio from the coastal road. 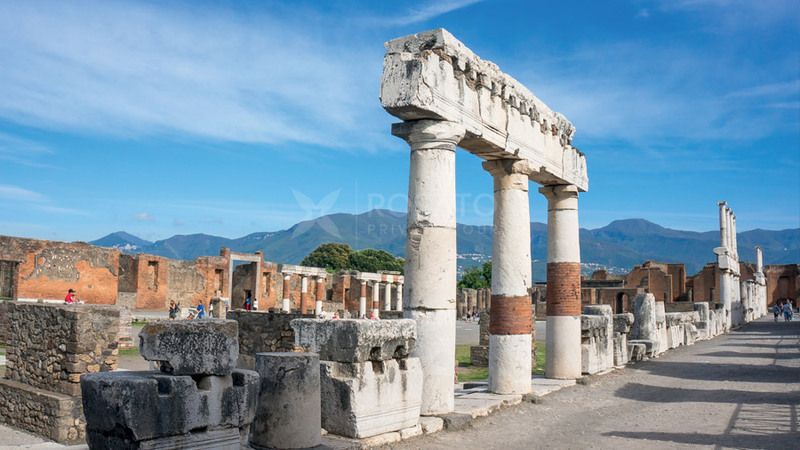 When we arrive in Pompeii, we will stop for a couple of hours at the famous ruins of Pompeii The Scavi. Famous worldwide, the excavations of Pompeii is the only archaeological site in the world, along with that of Herculaneum, capable of returning visitors to a Roman town, In 79 AD, an era from which the Vesuvius erupted causing devastation to the surrounding area. Pompeii owes its exceptional state of preservation the way in which it was buried, Tonnes of ash & pumice had covered over 6 meters of Pompeii but preserving it the same time, The same pyroclastic materials, united around invested bodies, have kept the mark, allowing archaeologists to find short but atrocious fears. The area also produces Provolone del Monaco which is a famous high quality cheese. Our Private Driver Guide will stop in Ravello, Perched on steep, terraced slopes, closer to the sky than the sea, with its unique breath taking view of the Amalfi coast, it is a place blessed with beautiful gardens, quiet lanes, sleepy, sun-drenched corners. Ravello provides unforgettable views over the azure coast below. An ancient medieval town known all over the world for its history, its excellent monuments, its magical landscapes and its patrician habitations. 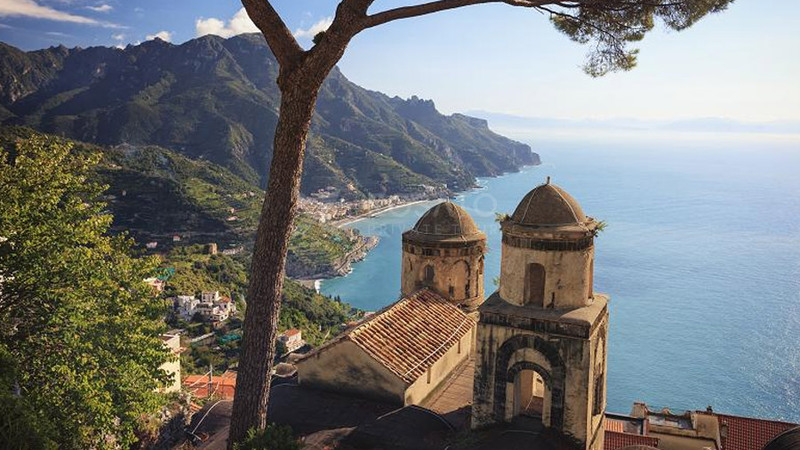 Enchanting land, as it was described by the most illustrious travellers of time that elected it Country of Spirit, Only visiting Ravello can you live intense moments of true magical amazement! There are many beautiful gardens and Villas to visit, in particular Villa Rufolo and Villa Cimbrone. The Amalfi Drive is a famous Winding road with breathtaking views of the beautiful stretch of coastline on the Mediterranean where we will stop in a number of places giving you opportunities to take memorable photos. 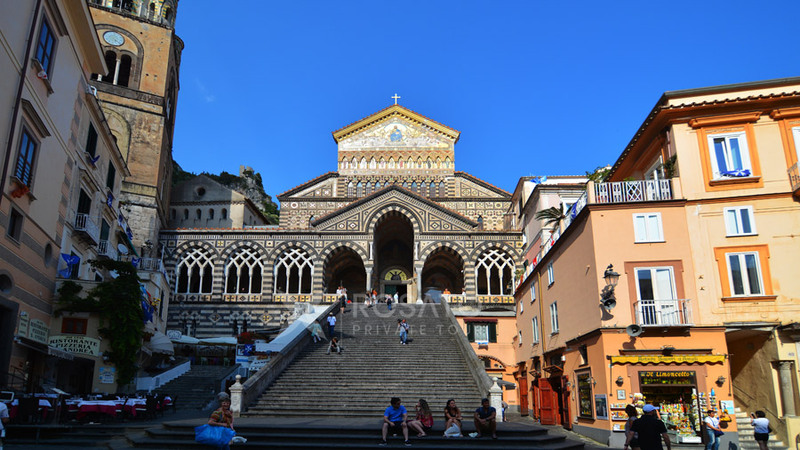 UNISCO awarded the Amalfi Coast a well deserved spot on the World Heritage list in 1997. Continuing our drive to Amalfi, we will pass through the Dragon Torrent Valley, named after a famous legend that here lived a terrifying dragon who breathed fire from his nostrils. The main town of the Amalfi Coast lies at the mouth of a deep ravine, at the foot of Monte Cerreto surrounded by dramatic cliffs and coastal scenery. where you can take a relaxing walk in the main Square Pizza Duomo and visit the beautiful cathedral of St Andrew, Museo della Carta (Museum of handmade paper), the ancient dockyards, or simply try a delicious gelato and admire the view of the waterfront. When we arrive in Conca dei Marini, you will find the famous Grotto dello Smeraldo, “The Emerald Grotto” a marine cave of luminous emerald waters that you can visit if you wish. Just beyond it, the road passes the fjord of Furore, one of the coast’s most impressive gorges, before arriving at the village of Praiano, and then followed by the most scenic and majestical village of Positano. The very famous vertical village, the jewel of the Amalfi Coast, thanks to its picturesque landscapes. Our Private Driver will take you to the heart of Positano, where you can stroll through the narrow streets to the main beach passing by stylish boutiques, outdoor cafes and restaurants. 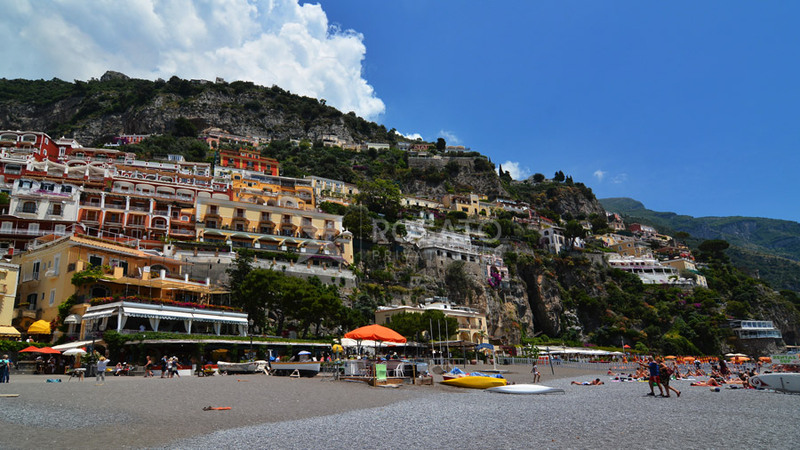 Positano has been featured in several movies including the very famous ‘Under the Tuscan Sun’. Also very well known for the Linen, Handmade Sandals & Ceramics. The church of Santa Maria Assunta is also worth visiting which features a dome made of Majolica tiles as well as the thirteenth century Byzantine icon of a black Madonna. The Itinerary for Sorrento Private Tour to Pompeii and Amalfi Coast from Sorrento is totally flexible and can be changed to your requirements.